Note: The following is a press release from the Indiana Family Action PAC. 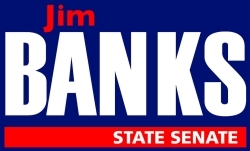 Indiana Family Action PAC is proud to announce our endorsement of Jim Banks for State Senate district 17. Jim’s body of work on pro-family issues is outstanding. Starting with his work with Focus on the Family to his current service on the Whitley County Council, Jim is a proven pro-family leader. As the only pro-life candidate in the district 17 Republican primary our decision was an easy one on behalf of the unborn members of Indiana families. Jim is a statewide conservative leader whose pro-family values start at home and are sorely needed in Indianapolis. IFA PAC Executive Director, Ryan McCann, had this to say about candidate Banks, "Working with Jim on pro-family issues, from his time at Focus on the Family to the present, proves to me that he is a pro-family leader we need in the State Senate. Jim is a man Hoosiers can count on to make Indiana a better place for Hoosier families to live, work and play." Indiana Family Action PAC is the sister organization of Indiana Family Action and Indiana Family Institute. Indiana Family Institute is the state affiliate of Focus on the Family. Indiana Family Action PAC is committed to helping principled state leaders dedicated to pro-family values become elected public servants.